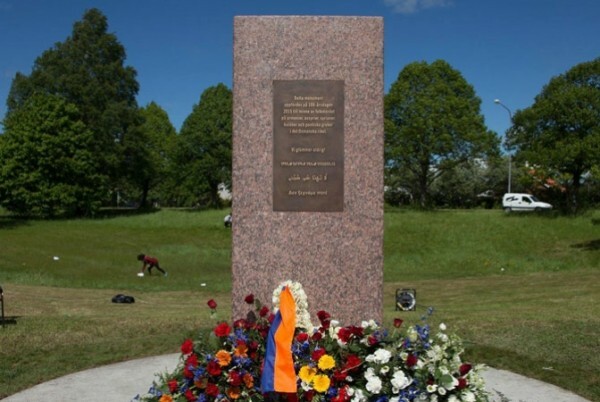 On May 29, 2015, the first 1915 Armenian Genocide memorial was opened in Sweden, in the city of Örebro. When serving as a MP in the Swedish Parliament, Murad Artin, from the Left Party in Örebro, initiated the process to get Sweden to recognize the genocide of Armenians, Assyrians, Syriacs, Chaldeans and Pontic Greeks in the Ottoman Empire. “The Left Party in Örebro and I proposed a motion of a memorial in 2007. Many years have passed, but it is a great honor to participate in the inauguration of the memorial,” said Murad Artin who is of Armenian origin. On the inaugural day, the memorial was visited by Armenian ambassador, Artak Apitonian, the Patriarch of the Syriac Orthodox Church Moran Mor Ignatius Aphrem II, Governor of Örebo County Maria Larson and City Council President of Örebro Agneta Blom.